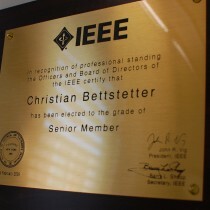 Christian Bettstetter has been elevated to the grade of Senior Member in the IEEE, one of the world’s largest professional associations for the advancement of technology. About 12% of all 382,000 members hold this grade, which requires significant professional maturity and achievements. Christian joined the IEEE in 1998 and is currently serving as program committee member of several major IEEE conferences, such as IEEE ICC and IEEE GLOBECOM.